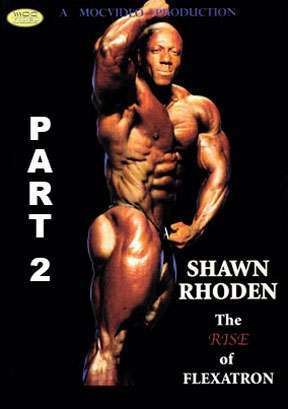 Join Shawn Rhoden in Part 2 as he trains with Charles Glass and Chris Cormier at the “Mecca” of Bodybuilding, Gold’s Gym, Venice, CA. This is a raw, uncensored and in-your-face video. No retakes, no set-ups or additional lighting. What you see is what you get. Hear the gym sounds drown out the microphone, yelling and grunting in the background, etc. Join Shawn Rhoden as he trains with Charles Glass and Chris Cormier at the “Mecca” of Bodybuilding, Venice Gold’s Gym, CA. Shawn travelled to California for an entire month to train with Charles and Chris, in hopes of creating the next Mr Olympia physique. After placing third in the world at the 2012 Mr Olympia contest, Shawn will do whatever he has to do to ensure a better placing next time around. With Ronnie Coleman as his sponsor and mentor, I would say that anything is possible! This is a raw, uncensored and in-your-face video. No retakes, no set-ups or additional lighting. What you see is what you get. Hear the gym sounds drown out the microphone, yelling and grunting in the background, bad lighting, etc. If you want a pretty, theatrical piece of work that will win an Oscar, go rent Titanic. If you want a real, no holds barred, what it’s really like in the Mecca, then this is your DVD. NOTE: The Arms and Hamstrings final segments are in Black and White, and yes they are supposed to have static and noise in the clips. It is gritty vision of a very gritty bodybuilding champion!